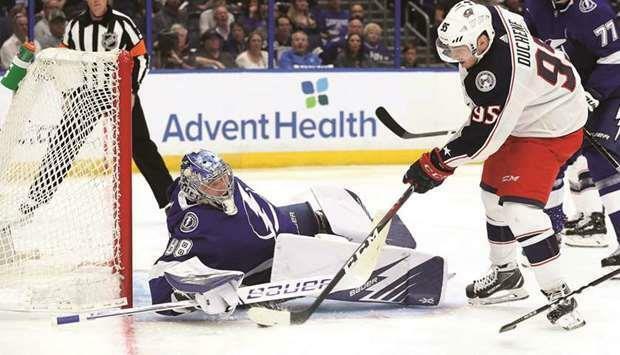 (MENAFN - Gulf Times) Veteran Matt Duchene scored his first career playoff goal and Sergei Bobrovsky stopped 23 shots as the Columbus Blue Jackets clobbered the Tampa Bay Lightning 5-1 to seize command of their first round playoff series. Duchene finished with a goal and three assists for the Blue Jackets who were heavy underdogs coming into the series and now have a 2-0 lead after winning the first two games in the Lightning's building. It is a shocking result for Columbus as nobody gave them a chance heading into the series against the NHL's top-seeded team which tied a league record with 62 wins during the regular season and finished with 21 more points than any other team. The surprise start to the series is also underlined by the Lightning's three lopsided wins over the Blue Jackets this season by a combined score of 17-3. But that means little now as the playoffs are another world and Duchene, Bobrovsky and Co are in full postseason mode, while the underachieving Lightning are trying to get by on reputation and skill instead of hard work. 'We didn't really give them a chance tonight, said Duchene, who joined the Blue Jackets at the trade deadline. 'We jumped on them right away. We get to go home and try to finish the job. We are humble about it and we want to make it happen. Columbus could wrap up the best-of-seven series with a pair wins on home ice in games three and four of the series on Sunday and Tuesday. 'We have a great group that buys into what we need to do. They are the best team in the league in the regular season their offence is insane. We just need to stay above them. Duchene, a member of Canada's gold medal winning team at the 2014 Sochi Olympics, started his career with the Colorado Avalanche in 2009-10. He also a short stint with the Ottawa Senators but his career has been plagued by teams that underperformed. He played in just eight playoff games previously with no goals and six assists. Duchene also recorded more than two points in a playoff game for the first time in his career. 'It took me a while to get my first NHL goal so it took me awhile to get my first playoff goal too, Duchene said. 'We just had a good game plan coming in. One of the biggest surprises of the series has been goaltender Bobrovsky outplaying his Russian counterpart Andrei Vasilevskiy, who led the league in wins this season with 37.